Sweet little Moe came to Best Friends in 2016 when his person could not care for him anymore. Moe was born in 2010 and is almost all black, except for his adorable white socks and belly. 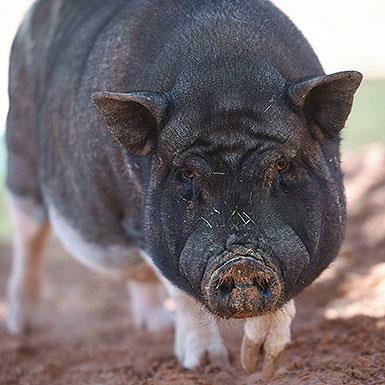 He is mild-mannered and social, loves belly rubs, going on walks, and learning new tricks on our Piggy Paradise "agility course." Moe does want a forever home where there will be another pig friend, so why not double the lovely feel of a piggy snout on your leg, asking for snuggles and treats?